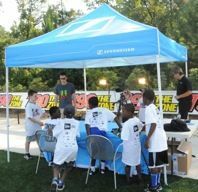 Audio specialist Sennheiser was a key sponsor of the weeklong New Era Football Camp held late last month in Atlanta, where it taught hundreds of children the basic principles of sports broadcasting through its hands-on, interactive broadcast bootcamp. The camp, which drew approximately 2,000 campers between the ages of 8 and 18, was held free of charge and featured several NFL stars including Demaryius Thomas, Harry Douglas, Marcell Dareus, Ray Rice and many others. The Sennheiser broadcast bootcamp is designed to give campers hands-on insight and experience into a variety of real-world sports careers beyond the field, while expanding their appreciation of the behind-the-scenes processes of sports broadcasting. While campers received physical instruction from top NFL players on the field, Sennheiser helped the children conduct mock interviews with professional sound equipment, in which each participant held a different role: cameraman, boom operator, commentator, script coordinator, slate operator and others. Interview footage will be made available for participants to share with friends and family, and each participant was given a pair of Sennheiser headphones. "We are grateful that New Era and Five Star Athlete Management included Sennheiser in this fantastic opportunity to give back to the community," said Eric Palonen, senior product specialist, Sennheiser. "We were astonished at the level of interest our broadcast boot camp received not only from the campers, but from parents and the athletes alike. We hope we left a memorable impression that there is a place for children to pursue their passion for sports both on and off the field." Last year, Sennheiser ran a similar broadcast booth for kids at the Lomas Brown Football Camp in Detroit, where many children from low-income families were introduced to the world of professional broadcasting. Sennheiser's audio equipment — including its microphones and headphones — is used predominantly throughout the broadcast industry and on almost every major-network sporting event. "As an NFL agency, we are in a position to have our players come out here and give back so these kids can have a once in a lifetime experience to interact with the players and learn skills at the same time," said Todd France, owner of Five Star Athlete Management. "It is great to give them exposure to broadcasting through Sennheiser, who was here to show them how things are done behind the scenes and let them try it out first hand." Ray Rice, running back for the Baltimore Ravens, commented: "I enjoyed the camp because while I am not the biggest guy in the world, some of these kids size me up and say, 'I can do this!' And they really can. It is a great feeling to have companies like Sennheiser here contributing to such a great cause. It is always special, because we can't do it by ourselves."